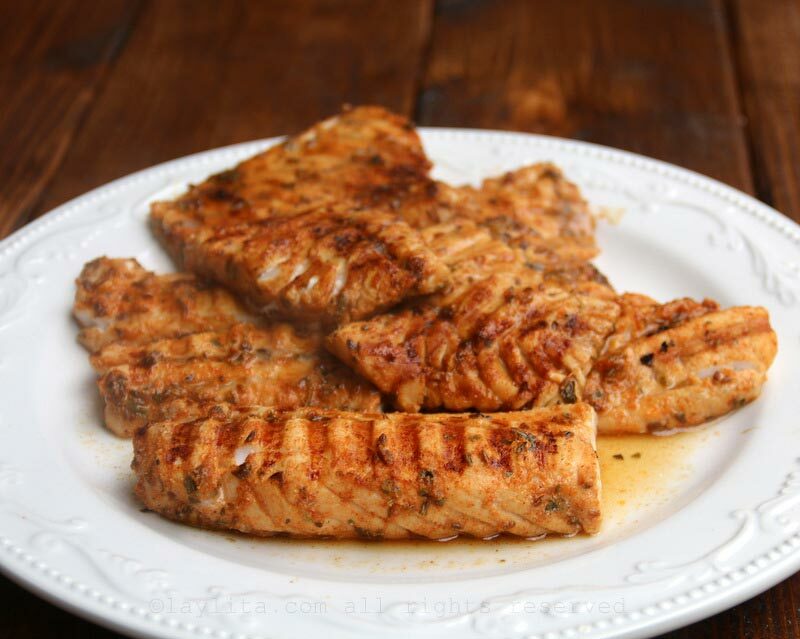 This citrus marinated grilled fish recipe is great dish for those who love fish marinated with citrus and spices. 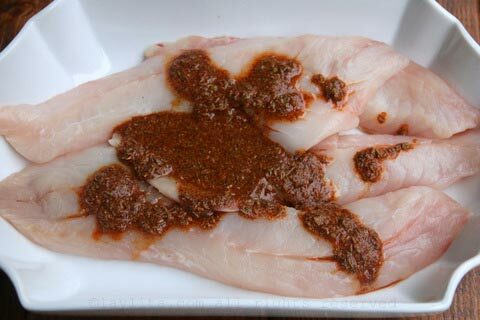 The marinade is made with sour orange juice, orange zest, chipotle powder, garlic powder, cumin seeds, and oregano. 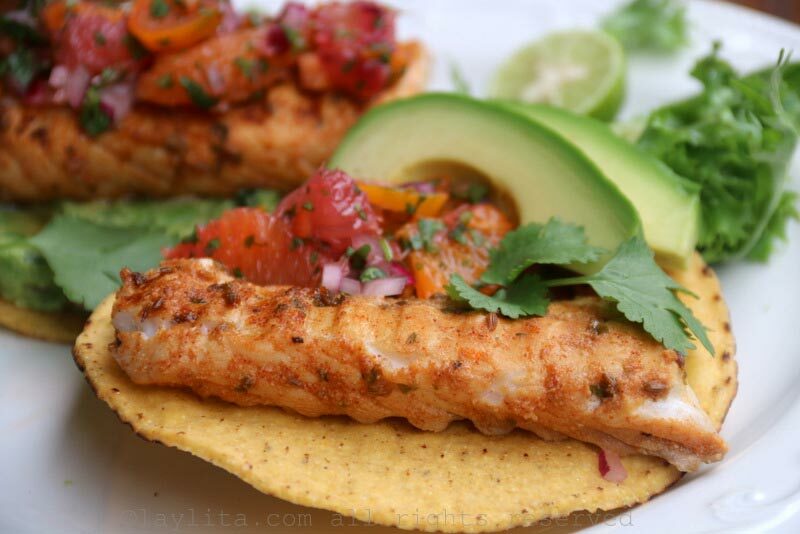 I used cod for this recipe, but the marinade will work well with other types of fish, you can try it with halibut, rockfish, mahi mahi, tilapia, and more. 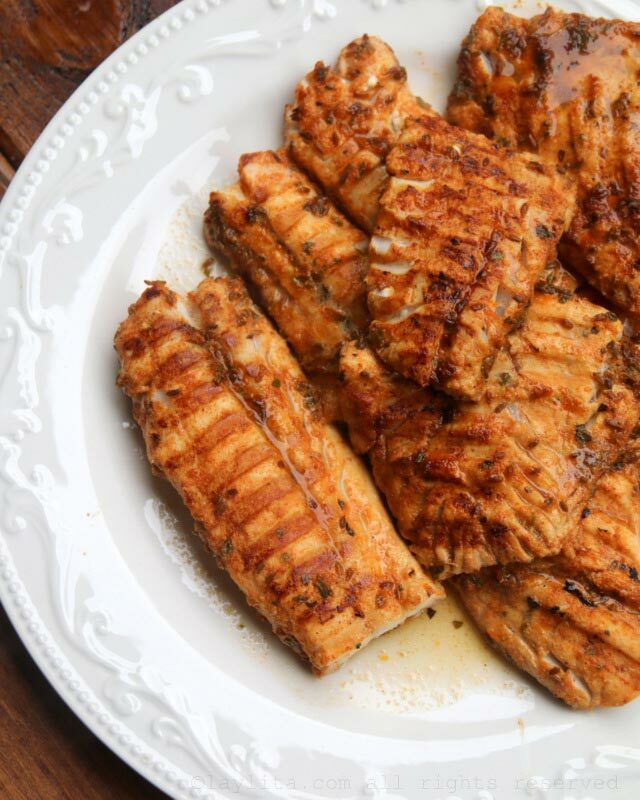 Recipe for citrus marinated grilled fish, made with fish marinated in sour orange juice, orange zest, chipotle powder, garlic powder, cumin seeds, and oregano. Fish can also be seared. 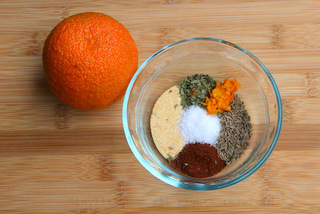 Mix the dry spices and seasonings with the sour orange juice and oil. 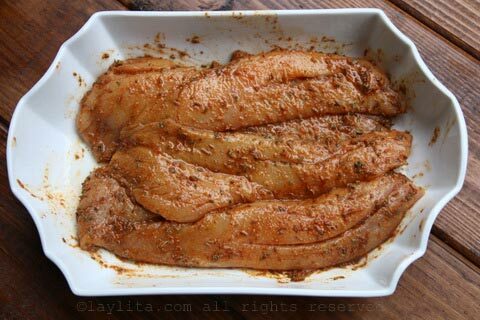 Rub the fish fillets with the citrus marinade and let marinate for at least 30 minutes. Pre-heat the grill, for the indoor grill, I usually heat it to max/searing temperature. Grill the fish to desired doneness. The exact time will vary based on your grill and the thickness of the fish fillets. For the indoor grill, it usually takes 5-6 minutes for the fish to be cooked but still moist. 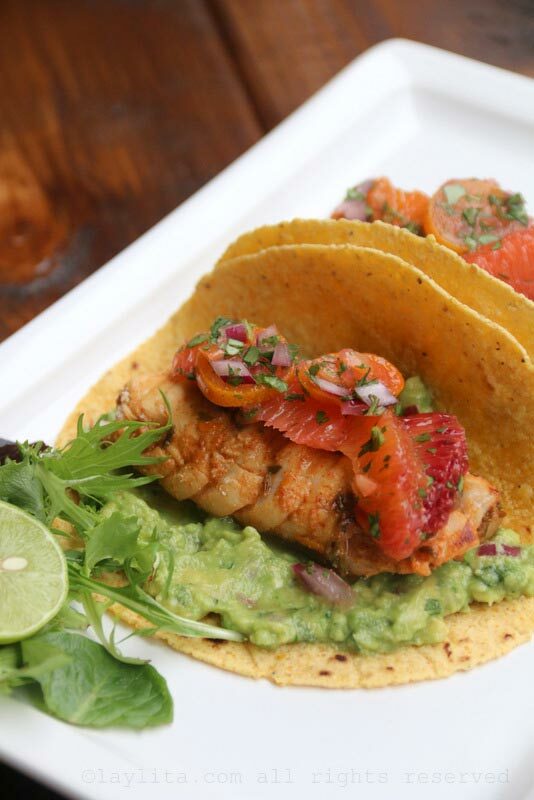 Serve the grilled citrus fish with your choice of toppings and side dishes. 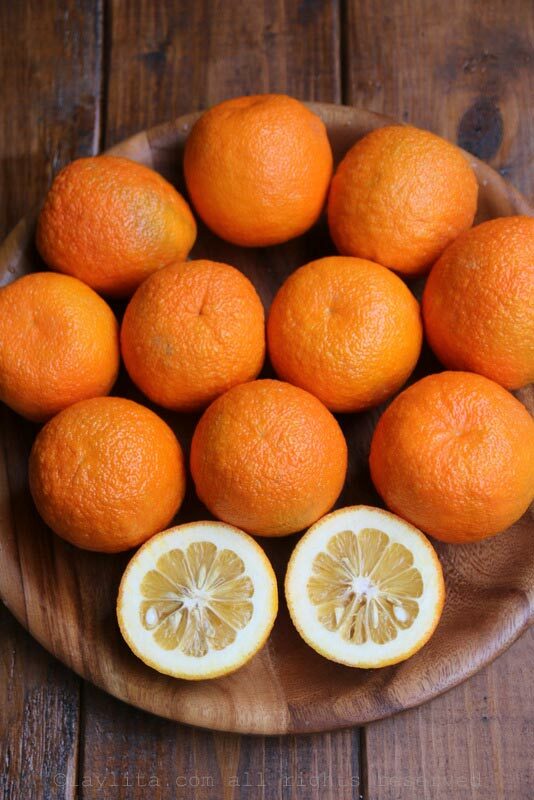 Sour oranges, called naranja agria in Spanish, are also known as bitter oranges or Seville oranges. We had sour oranges growing everywhere in Ecuador, as their names implies they are very sour and full of seeds, but have this amazing fragrance that hits you the minute you cut one open. In Ecuador, we mainly use them in ceviche, in jam, and in drinks. They’re very popular as a citrus addition to fresh sugar cane juice (jugo de caña or guarapo), since they contrast very well with the sweetness. I love cooking with them; they work great for any dish where you would add orange or lemons, and of course, make great marinades. Until recently I had no idea it was even possible to find sour oranges in the US. Then, thanks to a Persian friend, who invited us to celebrate Norooz, the Persian New Year, I discovered that they’re very common in Persian cuisine. The best place to find them in the US is at Persian or Middle Eastern groceries stores. 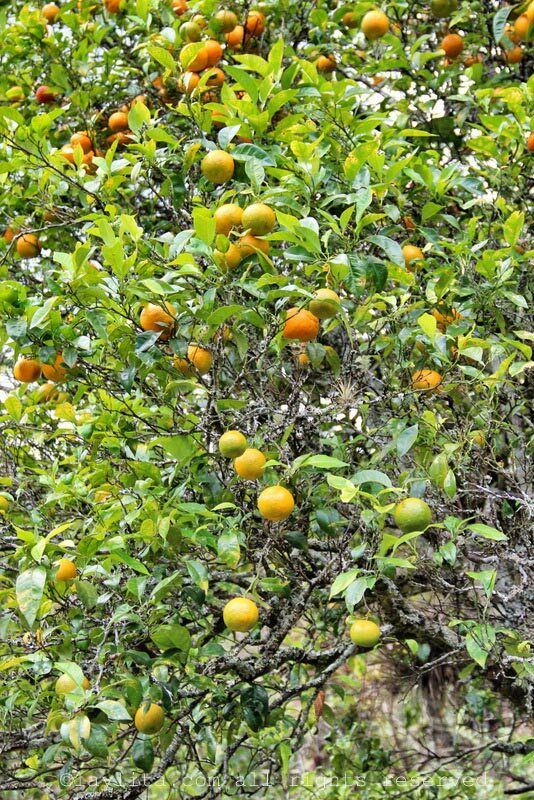 They are seasonal, like most citrus, so are mainly available in winter/spring months. It’s funny because every time I go to the Persian store to buy them, they look at me and warn me: “You know those aren’t regular oranges, right?”. Apparently many people buy them without knowing and then return them or complain that the oranges were bad. 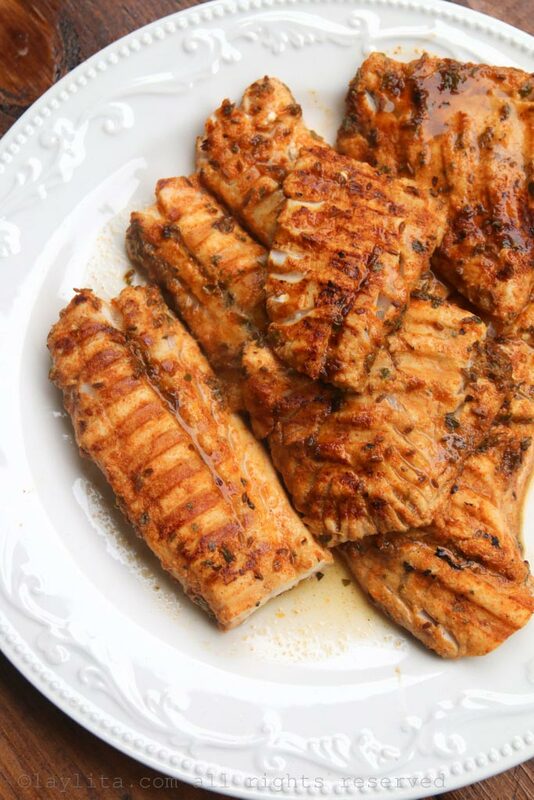 In case you can’t find sour oranges or want to prepare this citrus marinated grilled fish during the summer, you can replace the sour orange juice in the recipe with a mix of half regular fresh orange juice and half lemon/lime juice. I use an indoor panini style grill to make grilled fishes when it’s cold outside, and sometimes even if it’s not cold I still do so. 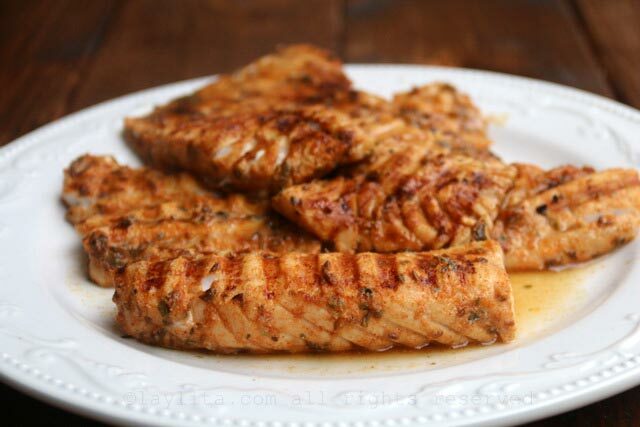 Grilling fish to the right point can be very tricky, but the indoor grill heats very evenly. Personally, this is the best way to grill perfect fish, it’s very fast, and you end up with beautiful grilled fish that is not overcooked. 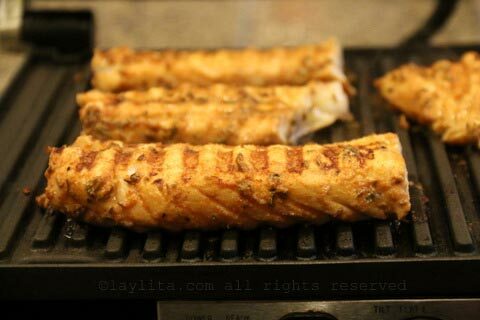 I also sometimes use the flat grill, a la plancha style, to cook the fish. You can also use a stove top grill or sear it in a pan with some butter if you don’t have an indoor or outdoor grill. 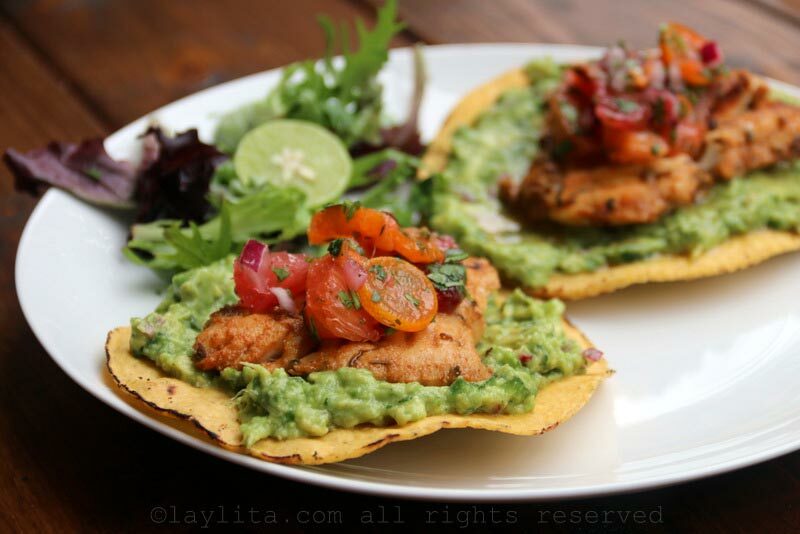 I served the citrus marinated grilled fish on soft corn tacos and/or with crunchy tostadas. 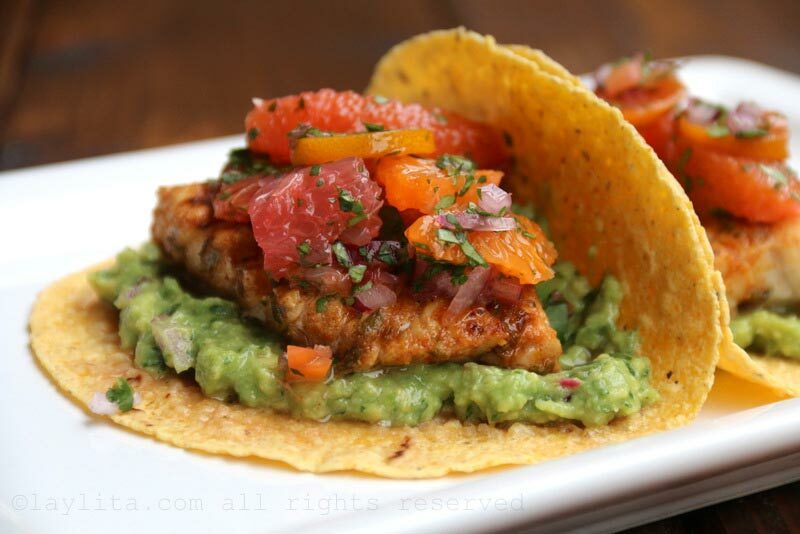 I also added either homemade guacamole or avocado slices, and topped it with my citrus habanero salsa. 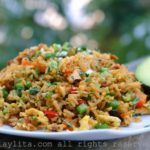 Other side dishes that work great with this citrus fish include Latin style rice, fried ripe plantains, and cebollas encurtidas (lime pickled red onions). 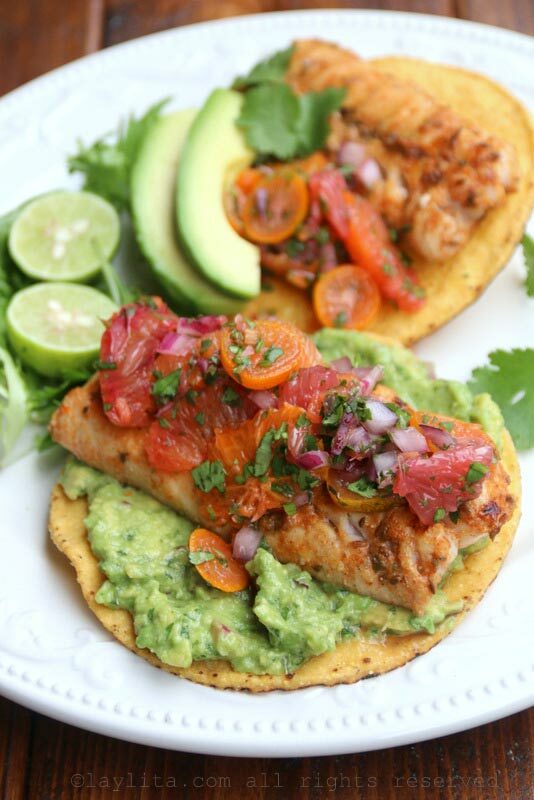 You can also use the citrus grilled fish as a topping for a lunch salad entrée: add a layer of salad greens, some avocado slices, the grilled fish, the citrus habanero salsa, and an extra squeeze of fresh lime with a drizzle of olive oil. Hi Laylita! This looks nice. Unfortunately I am in the Midwest and it’s too cold/snowy to grill outside (nor do I have an indoor grill! Do you think this would work fine if cooked in the oven? Hi Sara – Yes, you can also bake it or pan sear it on the stove top. What type of grill is the one you used? Could you send me the Brand and Model # ? I’ve been looking for a good one to use for my flank steaks, fish and chicken breasts. 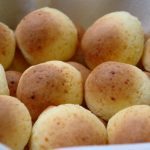 Me encantan tus recetas, vivi en Guayaquil 22 años y muero por la comida ecuatoriana. Gracias mil! It’s an old Cuisinart grill, just a regular indoor electric grill, can probably find one on Amazon.